UMB Blog » Personal Banking » Are you ready to purchase a home? Here are a few tips to help make sure you’re ready to start the home buying process. When you decide that owning a home is a life goal, you first need to assess your finances. A common down payment amount is 20 percent, but often lenders allow less. First-time homebuyers can even put as little as three percent down. However, a smaller down payment may mean a higher monthly mortgage payment and may require you to obtain private mortgage insurance, which is an additional cost. Evaluate different down payment options to help you establish your savings goals. Salary and geography matter. A recent report by HSH.com‡ provides information on the median home price, mortgage rate, monthly payment averages and salary you’ll need to afford a home in the 50 most populous U.S. cities. Add up the local and average costs of the above factors and subtract that total from what you feel comfortable spending on your home each month. The remainder is your ideal monthly mortgage payment amount. Determine exactly what you need in a house and separate those factors from what you want in a house. For instance, if keeping or decreasing your work commute is a priority, then a location near your job site is essential. Factors that may not matter as much, like a finished basement or hardwood floors, should be relegated to a nice-to-have list. With these tips in mind, you can begin your home search prepared with information about your finances, the market and the exact features you’re looking for in a home. 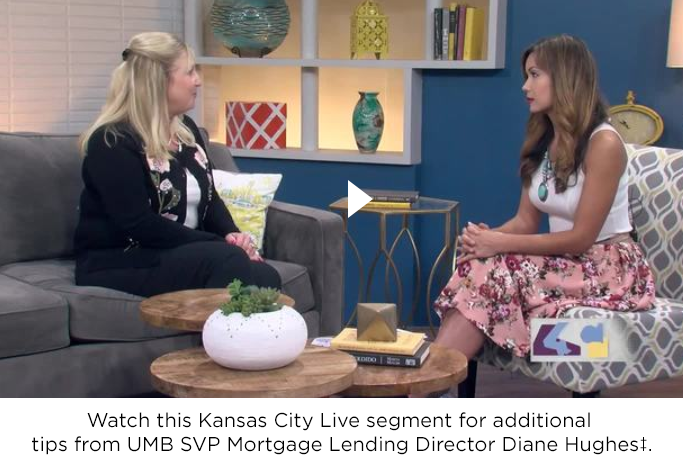 You can also learn more about the homebuying process at umb.com/mortgage.